A global rating agency is taking note of campaigns to reform no-fault insurance in a handful of states, saying the overhauls are “a positive development” for large auto insurance companies that have seen underwriting losses in several states with no-fault laws. No-fault states require drivers to purchase policies that pay for the policyholder’s own medical bills resulting from a crash, regardless of fault. That’s opposed to tort states, where the at-fault driver’s liability coverage pays for other parties’ damages. Fitch Ratings linked the higher number of claims in no-fault states to higher underwriting loss ratios, noting Florida, New York and Michigan as three states currently grappling with political responses to soaring insurance costs. 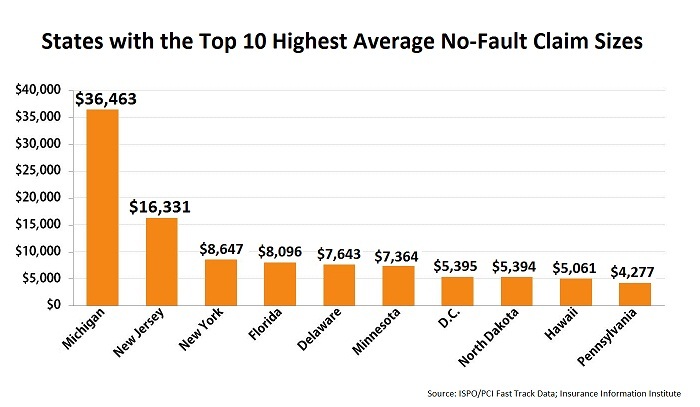 Those states had three of the four largest average no-fault claim sizes in the third quarter of 2010, according to the Insurance Information Institute. Twelve states in the U.S. have laws mandating that insurers compensate policyholders for medical treatment and other costs related to collisions, regardless of who was at fault. More claims bring higher underwriting losses in those states because insurance-related crimes and no-fault schemes partly inflate costs of the entire system, Fitch reported. As a result, consumers looking for car insurance quotations in no-fault states see higher rates compared with other states. The agency reported that, in 2011, direct underwriting loss ratios for personal auto policies continued on an upward trend in Michigan, Florida and New York, all of which ranked within the top 10 of states in the U.S.: New York with the ninth-highest at 71.2 percent, Florida with the fifth-highest at 72.7 percent and Michigan with the highest at 148.4 percent. Michigan’s direct underwriting loss saw a 33.2 percent jump between 2010-11, Fitch reported. Fees for driving in Michigan will get more expensive this summer, when a $175 fee kicks in for every vehicle in the state on July 1. The fee is 21 percent higher than in the previous fiscal year and goes to the Michigan Catastrophic Claims Association (MCAA), a reimbursement fund that collects mandatory yearly premiums from every driver in the state and compensates insurers for claims they have to pay that exceed $500,000. Michigan is the only state in the U.S. using a no-fault system paying out unlimited medical care under personal injury protection coverage. Since last year, the state Legislature has been debating HB 4936, which would eliminate unlimited benefits, give insured motorists there options of PIP coverage levels and install a fee schedule for PIP-related medical claims. The bill’s comprehensive approach would reform “the open-ended nature of the Michigan system and the MCCA reinsurance framework” that industry experts blame for rising rates of no-fault crime and plummeting underwriting profits, according to Fitch. The outlook for the bill is not clear. Fitch also noted recent measures to combat ballooning costs of PIP coverage systems in Florida and New York, both which reported crackdowns on PIP-related schemes. In New York, the state Senate in March approved SB 1685, a bill that classifies staging auto accidents, a common practice for criminals trying to take advantage of PIP reimbursements, as a felony and institutes harsher sentences for such crimes; the bill was one of three enacting similar enforcement measures. In February, New York and federal authorities reported dozens of arrests that broke up a Brooklyn-based crime ring they said perpetrated the largest illegal no-fault insurance operation ever and racked up $279 million in phony charges. Lawmakers in Florida pursuing reform through HB 119, a bill drastically changing the state’s approach to PIP insurance, applauded more than a dozen arrests of people in March allegedly linked to a two-year scheme of food truck operators who staged accidents to collect payouts. Reforms to HB 119, including caps on benefits, faced a rocky road through the state Legislature and would go into effect July 2012 if approved by Gov. Rick Scott. Fitch Ratings is part of Fitch Group, recognized as one of the largest and most reputable credit rating agencies in the U.S.